In 2017, Washington State’s education related tax plan underwent an overhaul, and, as a result, your next state schools tax bill will look different. You can read the fine print in Engrossed House Bill 2242. In 2018, the state will implement a “levy swap” that will cause a temporary one-year tax rate increase. The bump will occur in 2018, because it is a transition year. Existing voter-approved Maintenance and Operations (M&O) levies will remain in effect in local school districts, while the state phases in an increased state schools levy rate. 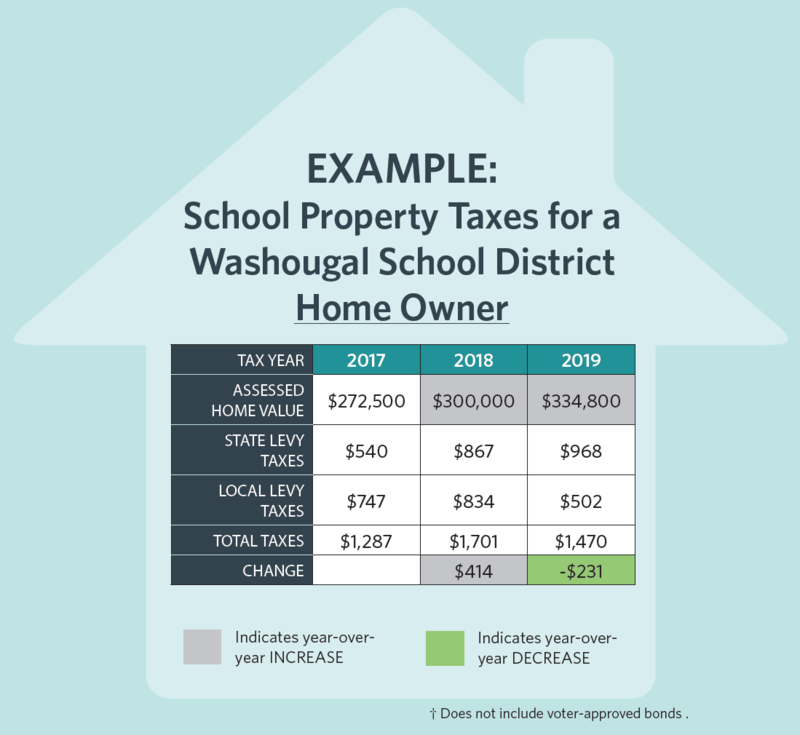 The following chart shows how the tax rates will change from 2017 to 2019 in Washougal School District. Amounts listed are the tax rate per $1,000 of assessed home value. In 2019, tax rates will likely be lower than in 2017, because school district M&O levies—now known as “enrichment levies”—will be limited to $1.50 per $1,000 of assessed value. The change will not affect voter-approved school bonds. For more information on the state property tax to support public schools, please visit the Washington Department of Revenue website. Though the tax rate for school taxes will likely be lower in 2019 than it was in 2017 because of the levy funding changes, the total taxes that home owners owe will likely still be higher. This is due to the rapidly rising property values in Clark County, and NOT the levy funding change. This table does not include the school construction bonds. Q. What is happening to Washougal School District’s current M & O Levy? A. The state is replacing Maintenance and Operations levies with Enrichment levies in 2019. The new Enrichment levies will be capped at $1.50. Q. Why does the overall tax rate spike in 2018? A. The statewide school levy will increase 91 cents in 2018, and the previous M & O levy will still be in effect. When the M&O Levy is replaced with an Enrichment Levy, overall school-related taxes are expected to decrease in 2019. Q. Was this a voter-approved tax increase? A. The state levy is not a voter-approved levy. The Washington State Legislature passed Engrossed House Bill 2242 and it is a new levy for the entire state. Q. What is an enrichment levy? A. An Enrichment levy (formerly a M & O levy) provides the district the ability to enhance the educational program through the following: extracurricular activities, athletics, health, safety and security staffing, special education, and professional development. Q. How will this impact taxes in the long run? A. The state legislature recently made significant changes to public school funding in the state of Washington. The State School Levy rate for property owners will increase by $.91 per $1,000 assessed value (AV) in 2018. This is not a change in the Washougal School District levy rate, but a change in the state rate. For many Washington property owners, including those in Washougal, this will mean an increase in property taxes for 2018. However, beginning in 2019, the Legislature has changed local M & O levies to Enrichment Levies, and capped them at $1.50 per $1,000 AV. This change would mean that property owners will pay less in 2019 and 2020. Q. Does this impact the WSD Technology levy or the school construction bond? A. No. 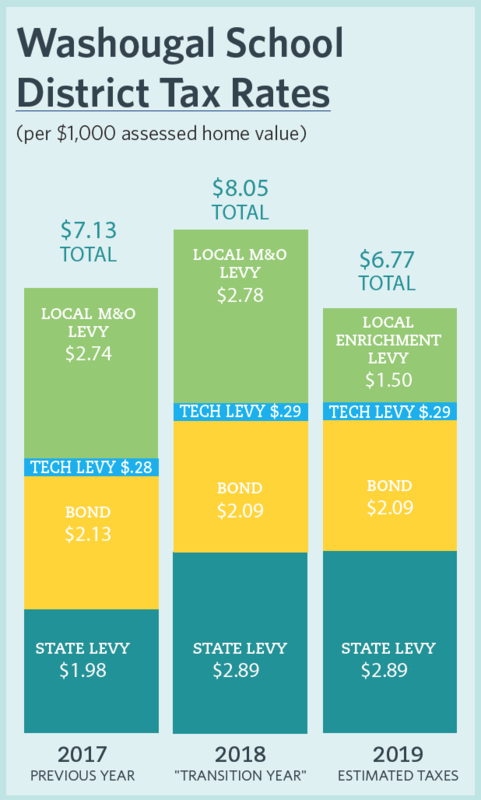 The voter-approved Technology levy should remain constant at $0.29, and the school construction bonds are expected to be around $2.09 in 2018 and 2019. Q. Does this impact low income senior citizens? Q. Why is the rate on my bill higher than the $2.70 rate stated in the legislation? A. Clark County’s rate is based on our county’s property valuations adjusted for fair market value. Our assessments were under the state’s fair market value and that is why our rate is adjusted up to $2.89.